A charity event that featured a live concert, a painting exhibit and a group discussion was held at the Okinawa Convention Center in Ginowan City by Reiko Uehara and Rikiya Asai on March 8. 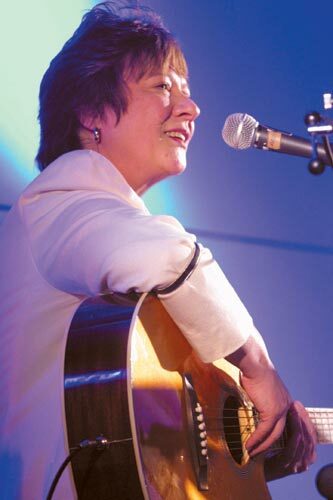 Born in Okinawa, Reiko Uehara is a unique gospel singer who has performed live concerts in Japan and around the world, including at prisons, schools and churches. She never knew her American father and was adopted by the Uehara family when she was only four months old, becoming the victim of prejudice in her early years. However, she discovered the answer to extreme hardship in the love of Jesus Christ when she was 18, and she got back on her feet. Her voice inspires people and gives them courage. You can sense a warm heart, kindness and strength of mind just from her voice, stemming from the fact that she managed to overcome her sufferings. Rikiya Asai, a painter who got his start when he was four years old despite being struck by cerebral palsy, was also invited to participate. A group discussion hosted by Rikiya’s mother, Miwako, regarding their hardship, followed by a concert by Uehara and a hula performance by a group from Hawaii highlighted the event, all of which was given in sign language. It was a deeply emotional experience for all who attended. Aba Music/Mini Stories, founded by Reiko Uehara, sponsored the event.